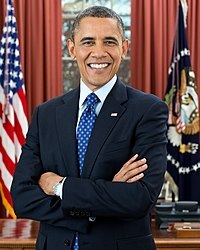 Barack Hussein Obama II ƿæs se fēoƿer and fēoƿertigoþa foresittend þāra Geāndena Rīca American. He ricsode for tƿǣm ealdortīdum of 20 þæs Æfterra Gēola 2009 oþ 20 þæs Æfterra Gēola 2017. Hē biþ gecunnod for his rǣd tō sellan gebiergende of hǣlþe tō þæm þearfendum American, þe hātte þā “Affordable Care Act” (Englisc: Undēorean Aldorceare Geswutelung) oðþe “Obamacare”. Man nīwanost wende þisne tramet on þǣre 17:38 tīde þæs 9 Solmōnaþ 2019.